Could anyone please have a go at this potential leak of the new Man Utd home shirt for the 2019/20 season? Is there a way to get stadium pictures to show up on the club overview screen and in the upcoming fixtures screen, please? East Thurrock is missing a "shirt" in kits&colours section of the editor in latest 19.3. official update. To see the home kit, add shirt in editor before new game. All other kits you mentioned are basicaly last seasons away kits that were declared as third kits for this season. They're often never used and are here just for reserve, in case some heavy colour clash comes in cup matches. To put them in pack, I require a proof that they were actually used, a game pictures, or at least their existence in club's web shop. Please provide links to game galleries or web shops where I can see particular kit in details. Thanks for any help to adding these kits to the game. Has anyone changed to real club and competition names on IOS FMT? "I am from Kazakhstan and in my country this game is not available for purchase. I would very much like to buy Football Manager Touch on Andoid, but I cannot in our country. Please give me your Google Account for 5 minutes to download your game on the tablet. If you want I can pay for it. Please need some help. Just need a username and password from your Google account, I will go into it for 5 minutes to download the game and then you can change the password. Please help." Member begging for access to my Google Play account and a free copy of FMT. The Android installation has the same folder structure as the PC version. The same real names patch (or any edt and lnc files) that works on the PC version will also work on the Android version. I am using just fine it on my Android installation at the moment. Same goes for graphics (logos, kit-packs, facepacks etc) though there's a few more hoops to jump through than on the PC to get them working. Good to know that real names and graphics work on Android tablets. Could you please give me a few tips in regard to getting graphics into FMT? Does anyone know how to make this work for FM18 Touch for Android Tablets? i have a Samsung Galaxy Tab S3. Does anyone know anything about importing graphics to an Android tablet? OK, no worries. Thanks for your reply. If anyone else has used this on tablet/ipad, it would be appreciated if you can let me know. Is it possible to install this on an Android tablet or an iPad to use with Football Manager Touch? 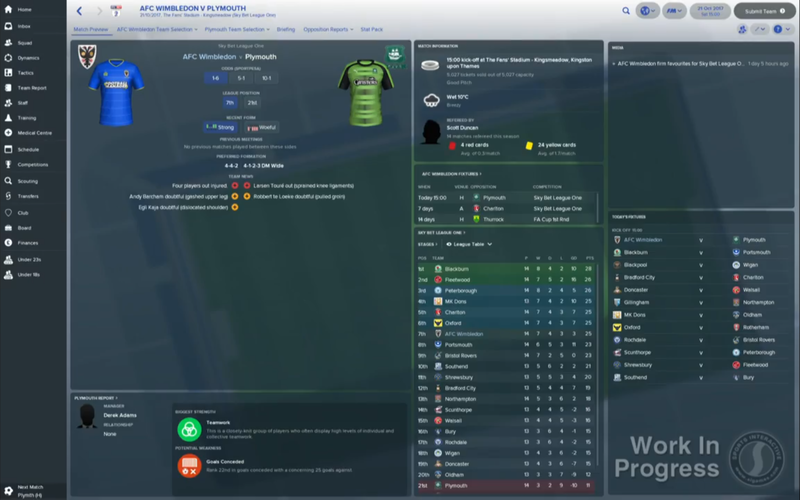 Has anyone been able to see if this is possible in FM18 yet? Either to find the UID of a generated female staff member or to replace the dark silhouette image of a female generated staff member (i.e. press officer)? You guys know SI have blocked the ability for us to use our own photo for our manager again in FM18, right? I noticed that there are already many SS kit packs uploaded to the site for FM18, but I imagine most of these are in the older 220x220 format. Are kit makers likely to re-release packs so they use the high-res style, or would any other kit makers look to make the packs again with the larger kits? I work on these all the time and I'm updating packs almost on daily basis without mentioning it here. So feel free to use these links every few days, it's very likely there will be new high res kits. @bolid74, your efforts a massively appreciated! High-res kits certainly look the way forward for FM18, so I hope your dedication will encourage many others to create packs to the same high standard. Glad to see that other people are eager to have this added to the game. By the looks of the latest FM feature video released on YouTube, female staff still have black silhouette faces, which is pretty ridiculous. Hopefully they may have made it easier for us to attain the UIDs, but I imagine that will be unlikely too. Have many people managed to replace the female default silhouette image with their own picture? I imagine this picture would then represent every generated female in the game though? High-res SS kits should be mandatory after this reveal for FM18. Will 'high-res' kit packs be more common this year? I think they look so much better in-game than the standard size we've had for years. There was a mixup transferring files onto a new server iirc - it's been fixed since then, but the 2x files still have am issue which is being fixed right now - when i last downloaded the megapack a few days ago there were no 'retina files' in the pack, just regular x2 folders where they should be. I downloaded the megapack directly from the Sortitoutsi site as a subscriber and I didn't find any retina file folders. Just the @2x folders which contain the old logos. Hope the fix isn't causing you too much trouble, kremmen. Yep I can see the problem, I just have no idea how it's happened as i uploaded a new pack for FM17. I'll get it fixed as soon as possible and thanks for bringing it to my attention. Please let us know when you have been able to fix the issue. I'm telling you that the megapack download on the Sortitoutsi site features folders (Small > @2x) that contain old logos. I've even just re-downloaded the entire megapack this morning with the latest update (4.88GB), but still the @2x folders within Clubs/Comps etc, contain old logos. i.e. Man City, Cardiff, EFL Cup. If you downloaded the megapack fresh from the site, you will understand the issue. Example: Man City & QPR have their old logos in the Small > @2x folder. In the main Small & Normal logo folders, they have the new up-to-date logo. However, in-game, logos from the @2x folder are used for league tables and in menus etc. Therefore, showing the old logos for certain clubs and competitions. Bare in mind that I have a new laptop, so I have been downloading megapacks like this from scratch. The folder above is from the megapack I downloaded this morning and is the latest on the Sortitoutsi website. And @vawkes I have no idea how you have such old logos if you have the latest megapack - that Citeh logo was changed in January 2016 so you must have an old version of the pack. It looks to me as though perhaps you downloaded the mega pack for 2016 rather than the 2017 one? If not, have you tried unticking the boxes on skin cache preferences then re ticking then reloading the skin? I've downloaded the latest megapack on the main site here. Size is 4.83GB. It can't be an old megapack though, as the new logos are there in normal and small size. Just not @2x. Amending the skin cache won't do anything as the old logos are in the small @2x folder. Therefore, they are only going to display what is in that folder. Seriously it seems that the @2x folder is old. Perhaps a mistake has been made in a previous update causing this. I urge anyone to download the full megapack from here to see the issue I am trying to explain. I've not noticed any old small logos showing. Can you post some screenshots to show the error? Right. I've just re-downloaded the entire megapack from the site and there is definitely a major error in it. In the Clubs/Comps > Small > @2x folder, many of the logos are old. i.e. Man City/Premier League. When viewing league tables or using the in-game browser, old logos are shown, but the new logos show on their own screens - since normal sized logos are used here. This is what is in the current download on the main site, so I suspect many others have been affected by this. Can someone responsible for the megapack at least check the most up-to-date download on the main site here, to see the problem for themselves?